Mettowee Spring fling was an absolute free for all. It was also pure Anarchy. Hundreds of Mud trucks, jeeps, rock crawlers, four wheelers, dirtbikes, side by sides, and thousands of people. All with absolutely not rules. and I mean NO RULES. the Jeep ran great and didn’t get stuck once, we removed the thermostat before unloading it and it didn’t skip a beat. Except for a brief electrical fire from the blower motor five minutes after getting it off the trailer. I honestly couldn’t believe how well it preformed for not being ran in almost two years, with bald tires and such. Earned its Jeep nameplate that day. It actually ran so great that I decided to not sell it and bring it home and better it for the next event or next year. 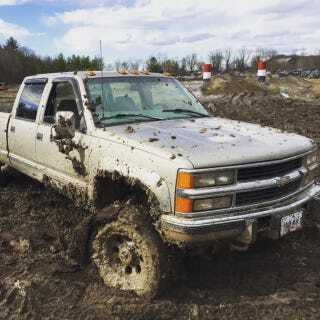 The k3500 was a tank and received many compliments for being “badass” all while pulling numerous other rigs from the mud. Here are some pictures and a quick video of the jeep on a trail. unfortunately my phone was dead most of the day so I don’t have many great pictures. Lastly, a fellow sub $500 XJ’r got himself hung up and almost rolled it. Luckily (? ), his diff housing wedged him up on both ends. I’m waiting on more photos from my friends, will update when then come.